In 1960 Dwight D. Eisenhower was president, over 300 thousand braceros were brought into the US on work visas, and there were eleven people living in the home of Nabor and Emilia Preciado. The entire purpose of this second trip to America was to make money, not to waste it by hanging around the border. For the entire night, Nabor sat and fought off thoughts of imprisonment. It was quite difficult since his own father was incarcerated for illegal immigration when Nabor was still a child; a child who needed his father just as his own children needed him now, including his fourth born son who just happens to be my dad. Geez, my neck is hurting from all of this generational whiplash. Mexican workers await legal employment in the United States. 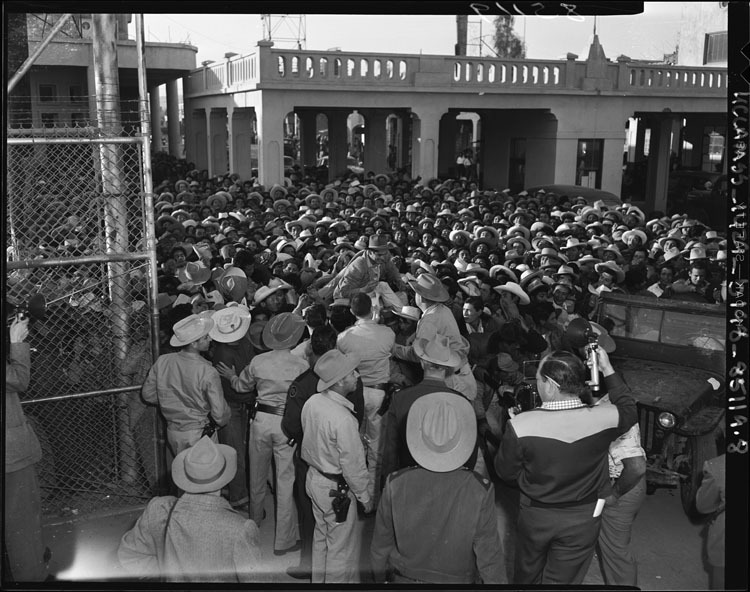 “MexicaliBraceros,1954” by Los Angeles Times photographic archive, UCLA Library. Nabor was not incarcerated, but he was deported back to Tijuana. Now he had a difficult decision to make. Go back home or risk imprisonment trying to cross the border again. Nabor hung around T.J. for a few days as he was making up his mind. Lately, the ice delivering business was not doing so well. Everyday Nabor lost more and more customers to the latest breakthrough technology to hit Mexico…refrigeration. This trip had to succeed so he decided to risk it. Once again, Nabor held out his visa and tried not to look as nervous as he felt. Once again, everything seemed to be going fine, but the last time everything seemed to be going fine he ended up detained and deported. This time, however, no one stopped him, no one detained him, and he made it into San Diego with no problems. He still kept trying to spot where La Migra was hiding, waiting to swoop-in and arrest him, but they never showed. Nabor decided to make his way to the bus stop and look for the trap that La Migra was setting there. He didn’t find them. There was no one after him; no one was trying to keep him away from his kids. Once again, he decided to enact his simple and yet effective plan of changing into a suit, buying an English language newspaper, and making the long bus ride all the way to LA. It went off without a hitch; well, at least for Nabor it did. There were plenty of people who were pulled off the bus and deported, but they kept overlooking this young man who barely knew how to speak any words in English let alone read them. Nabor made it to LA and then to Oxnard where his brothers Ramon and Ismael were, just as he did a decade ago. And he went to work trucking lemons as he did a decade ago except that this time, as he was getting into the truck yard to begin his first day, he began to have excruciating pain in his stomach. Excruciating is putting it too mildly. How did Grandpa Next Door describe it again? That’s right. That’s how my grandfather described it to me and as I previously mentioned, he is a beast. It must have hurt pretty badly for Grandpa to describe it as a feeling of impending death. Ismael, Nabor’s brother, wanted to take him to the hospital right away, but he refused. Nabor needed to make money remember? Just because he thought he was going to die didn’t mean that he got to take a sick day. Ismael stopped listening to his refusals when Nabor began to vomit uncontrollably. They got Nabor to the hospital and the doctors rushed him into emergency surgery, saving his life. When he came to, he learned that he had appendicitis and most likely would have perished if they hadn’t gotten him to the hospital so quickly. Come to think of it, he probably would have died if he had been treated in Mexico. I mean didn’t the ice delivery man before him die of a botched appendectomy and its resulting infection? What was with the ice delivery guys getting appendicitis? Was it something in the water? Or ice? Ice is still water right? As much as I would love to continue this line of ridiculous ponderings, something important actually happened after Nabor learned how close to death he had come; he learned that there was an immigration officer there at the hospital that wanted to imprison him. Nabor wasn’t quite out of the woods yet. As he was laying in his hospital bed trying to recover from surgery he learned of a battle that was being waged over his very soul; Nabor’s doctor wanted him to stay put so that he could heal properly and not die from being moved too soon; the gung-ho immigration officer of doom wanted to throw Nabor in a cell regardless of his state of health. After arguing for a few days, Officer Doom backed off and permitted Nabor to remain in the hospital until he was healthy enough to be deported. Whew! Dodged a bullet on that one! The doctor pushed it as long as he could, but even after 17 days in the hospital Nabor was still in no condition to make the long trip back to Magdalena. True to his word, the doctor discharged Nabor and arranged for his brother Ramon to drive him back to the border. Not wanting to risk the slammer again, Nabor agreed. What other choice did he have? The ride with Ramon was bad enough, but the bumpy bus ride when he made it across the border was almost unbearable. “From the surgery?” I said. When he made it to Mexicali he had to wait for several hours for the next bus to Santana. This gave him plenty of time to think about how miserable he was. His stomach was still blown up like a balloon and he had absolutely no money to buy any kind of medicine. “Finally a man in Mexicali bought me a 7-up and that made me start burping,” Grandpa Next Door said. See what I mean when I say that Grandpa Next Door was fortunate to have been treated in America? This was the extent of medical help in Mexico. Recovering from major abdominal surgery? Just drink a soda! That should do the trick! To say that it was a miracle that Nabor made it home alive would be an understatement, but he did. Against all odds, Nabor drank that 7-up, burped, took another bus to Santana, and then a cab to Magdalena. Nabor was finally home. You’ve done it again! I can picture it all in my head, which is quite lovely because I have a good imagination, BUT I want to see it as a movie or a television show!